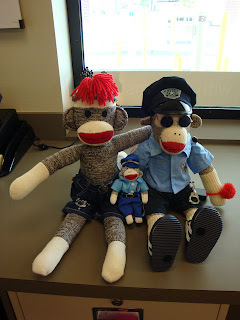 Officer Po Po and his son Po Junior participated in Sock Monkey Friday at the bank today. They were delighted to meet a new friend named Eugene, whose human is one of Laura's co-workers. Eugene, Po Po and Po Junior experienced monkey zen via the trickling waters of this delightful fountain. Po Po is always on duty, no matter what. 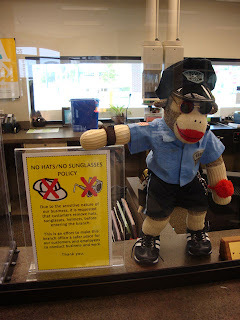 He made sure that incoming customers abided by the bank's security procedures. He had the pleasure of meeting Officer Edith today, who is one of this county's finest human law enforcement officers. She said that Po Po made her proud to be a police officer! Normally Po Po shows very little emotion, but I think he may have blushed at her compliment, which was quite an honor. 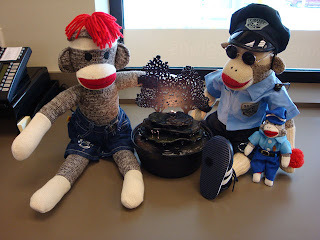 While Po Po and Junior handled security, Eugene concentrated on customer relations. 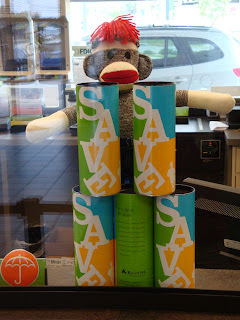 He wanted to encourage everyone to save money, as demonstrated by the coin banks that are displayed on the teller line. Hey, how about a bank promotion where the bank gives customers a 'piggy' bank in the form of a hollowed-out sock monkey with a slot in his head for coins? That would be in keeping with Crystal Beach's 'rich' sock monkey tradition (har, har). You might get some media coverage, too. Unfortunately that would probably cost too much money, but it is a fun idea. I wish I worked in the marketing dept.